Claire Fontaine currently has two exhibitions in San Francisco at the Wattis Institute’s new Logan Gallery and at Queen’s Nails Projects. 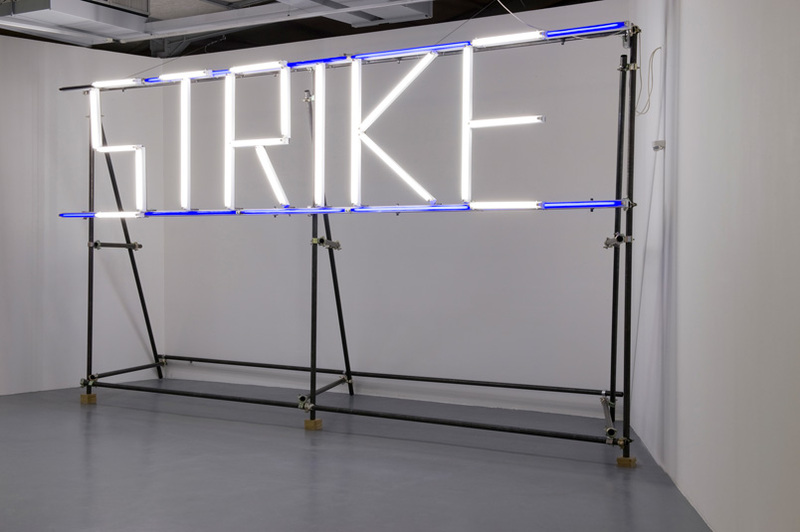 They have exhibited regularly in the Bay Area and their popularity is in part due to the Bay Area art scene’s ongoing interest in radical politics and aesthetic practices. 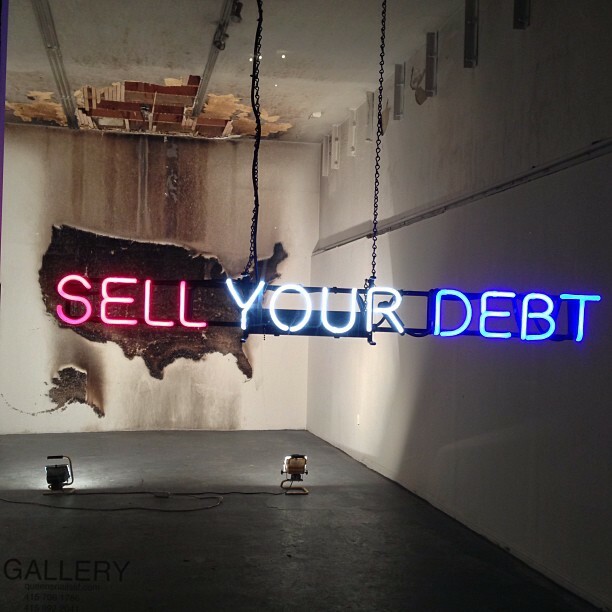 “Sell your Debt” is at Queen’s Nails Projects?, 3191 Mission Street, San Francisco?. 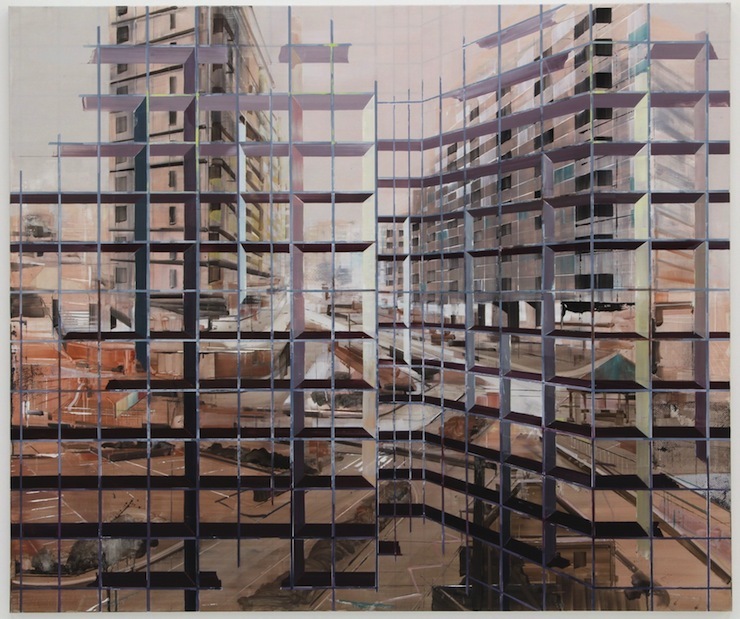 Trans-Location, at San Francisco’s Hosfelt Gallery, features new paintings by Driss Ouadahi. Ouadahi was born to Algerian parents in Casablanca, Morocco and studied architecture in Algeria before attending the Kunstakademie Düsseldorf. He has shown widely over the past decade in Europe, the United States, the Middle East, and North Africa. Through his training in architecture and his continued engagement with architectural subject matter, he has developed a distinctive style. His paintings reflect an ongoing interest in architectural forms, while addressing the immigrant experience. Many of his paintings are based on the forms found in generic modernist housing blocks, a type of high-rise building that houses immigrants on the metropolitan edges of cities across Europe. By using these forms Ouadahi’s paintings create a feeling of distance, echoing the distance of the immigrant experience and the alienation of life felt in the metropolis. In Trans-Location, his new series of paintings created over the past four years, he offers a particular view into this isolation—a lonely view from a high-rise apartment block. Each of his paintings offers a depiction of the Modernist ur-city, an airless, quiet no-place. His haunted, dreamlike cities signal the dream of death of the modernist city and its essential alienation. The city is not just emptied of life, but is also just out of reach, inaccessible. The atmosphere is oppressive and constrained; however there are signs-of-life hidden in the margins. Traces of parks and playgrounds can be found at the feet of buildings, a recurring detail that Ouadahi carried over from earlier works. Ouadahi captures an eerie feeling in his cityscapes and the high density buildings take on the quietness of de Chirico’s uncanny cities. He uses a colorful, yet intentionally limited and subdued palate. Each color choice further increases the sense of separation found in the compositions, forcing the viewers to see the city through windows of tinted glass. The exhibition contains ten paintings in this style ranging from 3-10′ wide. The vantage point remains the same, affirming the generic spatial format of the city grid as seen from the high-rise. Each painting has a structural grid overlaying the view of the city, much like bars on a window, that creates a formal visual element separating the viewer and city. The overlays are like interlinking steel girders, the steel skeletons that allowed for the invention of the high rise building. The surface is flattened and forcefully separated by the overlay. These overlays expose both the structure of buildings and their purpose of social separation. The motif is a bit repetitive and more varied views of the empty city would provide further insight into Ouadahi’s world. Trans-Location also features four paintings in a different, more minimalist style depicting detailed sections of chain link fence. 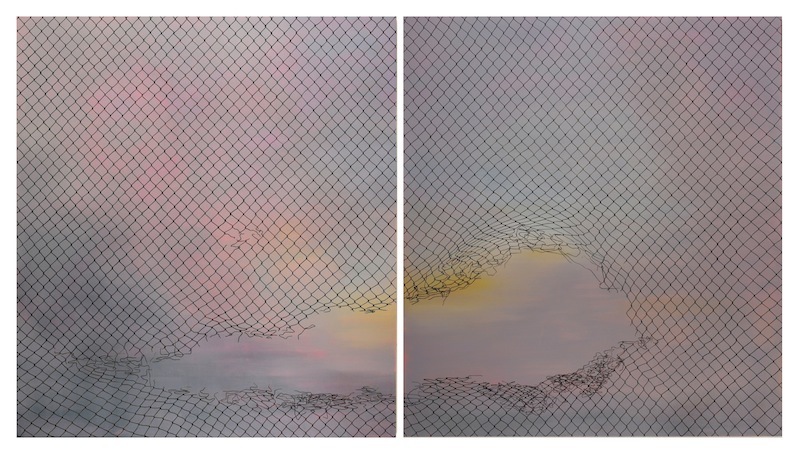 He pairs two very similar 3’ x 3’ paintings and a 6’ x 5’ diptych of chain link set against an early evening purple sky. The fences have holes and gaps in them, alluding to the possibility of escape from the process of enclosure or of the potential for adventures. The grid made by the chains also creates another type of barrier—a veiled and abstract figure to the sky’s ground. The contrast between the foreclosed nightmare of the city views and a line-of-flight through the fence brings an overall balance to the series. The legacy of Late-Capitalist Modernism has led to a looking glass world of urban separation. While the rich quickly gentrify the inner-cities and sequester themselves in shiny new buildings, the poor are quietly pushed to the edges. 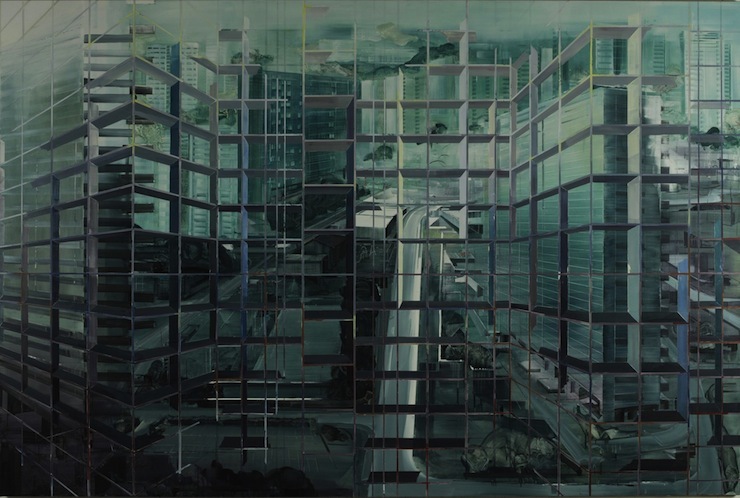 Driss Ouadahi’s paintings reflect an immigrant experience in the changing landscape of the global cities where his paintings are exhibited. Ouadahi eloquently captures this sense of emptiness and abstraction that comes with the view from the high-rises and points towards elusive desires.